What you wear on your feet is incredibly important. You need to have proper shoes in place for the activities that you do in your life. The shoes you wear have an effect on your entire body – they can lead to back problems, feet problems, and everything in between. If you are playing sports that is a whole different matter. Water sports are some of the most fun you can have: boating, wake boarding, water polo, the list goes on and on. When you play any of these sports it is important that you have proper water shoes in place. Water shoes can give you the support that you need, while keeping your feet comfortable for hours on end, and protecting them from outside problems. Today we are reviewing one of the most popular pairs: the WateLyves Women’s and Men’s Water Shoes. There are so many water shoes that can be purchased online these days that it can be hard to know which to buy and which to stay away from. So why did we decide to review this product from WateLyves? Brand recognition and respect always come first for us. You want to buy from a brand that you can trust, that delivers high-quality products at great prices. The WateLyves Women’s and Men’s Water Shoes is the perfect example of this. This product has been made for anyone who needs a new pair of water shoes. There are so many color options for this model that it can work for both women and men. They also have smaller children’s sizes so you can get a pair for the whole family all for an affordable price. When you purchase the WateLyves Women’s and Men’s Water Shoes it comes with a pair of high-quality shoes. We recommend ensuring you are getting the style that you want, especially if ordering online. If you are purchasing from a website, such as Amazon, we recommend that you have a return policy in place if they aren’t to your liking, or there’s a quality control problem involved. The WateLyves Womens Water Shoes are one of the best sellers on Amazon when it comes to outdoor shoes for women. If you are looking to save some money, these are definitely a pair you are going to want to look into because they are high in quality at an unbeatable price. One of the best things about these water shoes is that they are available in a variety of styles that range in colors and patterns. No matter what you’re looking for, there is going to be a water shoe for you among their list. 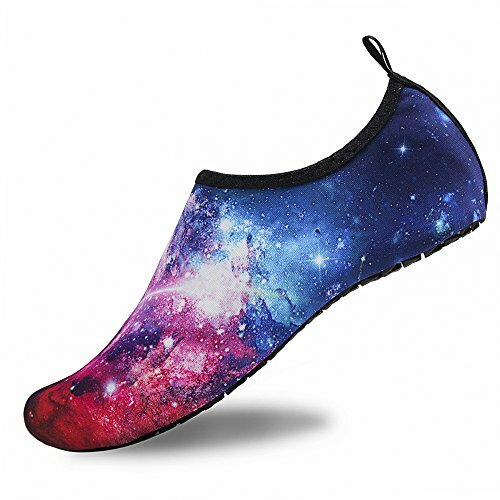 They have been made out of 92% polyester with 8% spandex located on the upper portion of the shoe. They are super lightweight, perfect for packing and for using in sporting activities such as water polo. They are great to have when going on vacation and going in the ocean. To get the most out of your new shoes, you need to actively spend time in the water to really ensure they are being used to their maximum capabilities. They are especially great if you are using them doing a physical activity, such as hiking, or playing a water sport. If you are just casually using them to go in a pool that is completely okay, but will not be taking advantage of all their great properties. To use them simply slip them on as you would any shoe, making sure that they are fit properly. Now, these water shoes may not be the best ones for you, depending on what you are looking for. This is no problem as there are two alternatives available that still work great and have a variety of different features. The VIFUUR Water Sports Shoes and the Heeta Water Sports Shoes are great alternatives. They match the high quality of these WateLyves water shoes. If you want one of the best water shoes currently on the market, we strongly recommend the WateLyves Women’s Water Shoes. First of all, they are extremely comfortable to wear and you can have them on for hours with the protection that you need. One of the most important things, in our opinion, when it comes to water shoes is the traction on the sole. These have strong traction especially around the heel area. If you find that the WateLyves Womens Water Shoes are not the best ones for you, we recommend looking at the WateLyves brand and seeing if they have alternative models which may work the best for your needs.